There are a few events whose dates are traditionally of significance in the life of a warship of the Royal Canadian Navy (RCN). Significant dates are usually those recorded in official and public ship listings, and include keel laying, launch, commissioning and paying off. Due to modern shipbuilding methods, and from project management, public messaging, operational and historical perspectives, there are other dates that can also be of interest. Announcement of Project. The government public announcement of intention to build a ship or multiple ships of a class. Selection of Shipbuilder. The government public announcement of which company will build a ship. Selection of Ship Design. The government public announcement of the general design of a ship. Announcement of Name. The government public announcement of the intended name for a ship. At this time it is correct to refer to “the future HMCS Name.” A name is not official until the naming ceremony. Cutting Steel. The actual start of fabrication of parts (by various names: units, modules, blocks) of a ship. Launch (date launched). The event marking the entry of a ship into the water, either stern first, bow first, sideways (beamwise) or floated up. A launch usually occurred immediately after a naming but in modern times if the launch will take some time, it can be prior to the naming ceremony. Acceptance (date completed). 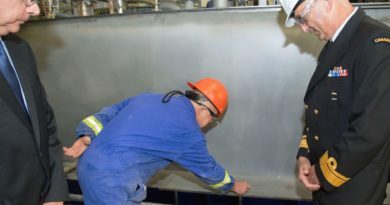 The event when a certificate is signed by project and other government staff and by shipbuilder representatives indicating that the builder has achieved contract requirements to date and that the government will now assume responsibility for the ship. The event is marked by a small ceremony, usually in the ship’s captain’s cabin. Acceptance can be considered as ‘delivery’ of the ship by the builder, though that may be affected by contractual stipulations. After the acceptance a naval officer assumes command of the ship. The ship is legally in commissioned service as of this time, and the identifier HMCS (Her Majesty’s Canadian Ship) is put as part of the ship’s name. Commissioning. The traditional and major public ceremony marking the entry of the ship into active service with the Navy. It is not the ship which is commissioned but the commanding officer, however, the expression is usually ‘commissioned ship.’2 As periods of commissions equate to duration of each commanding officer, a ship may go through multiple commissions, but it is usually only the first commission and any after a major refit when the ship spent an extended time in a builder’s yard that a ceremony is conducted. Change of commands are marked by their own ceremony. Initial Operational Capability (IOC). IOC is defined as “the first attainment of the minimum ability to effectively employ a new or improved capability, and for which adequate infrastructure, training, staffing, and support are in place, both for the new capability and for the organization employing it.” At IOC there is the equipment and the trained personnel to start operational use. Full Operational Capability (FOC). FOC is defined as “the full attainment of the ability to effectively employ a new or improved capability, and for which fully achieved infrastructure, training, staffing, and support are in place, both for the new capability and for the organization employing it.” At FOC the project team deems the objectives of the procurement achieved. First Operation/Deployment. The event when a ship first departs home port to undertake operational taskings or exercises. End of Project. 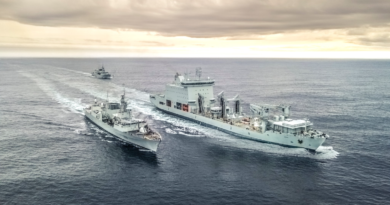 The disbandment of the team managing the procurement, and turnover of management of the ships throughout their lives to shore staffs of the Department of National Defence (DND) and Canadian Armed Forces. Paying Off. The traditional term for taking a ship out of active service. The ship’s company departs the ship, which is turned over to shore staff for disposal or being placed into reserve. Paying off marks the end of a commission. 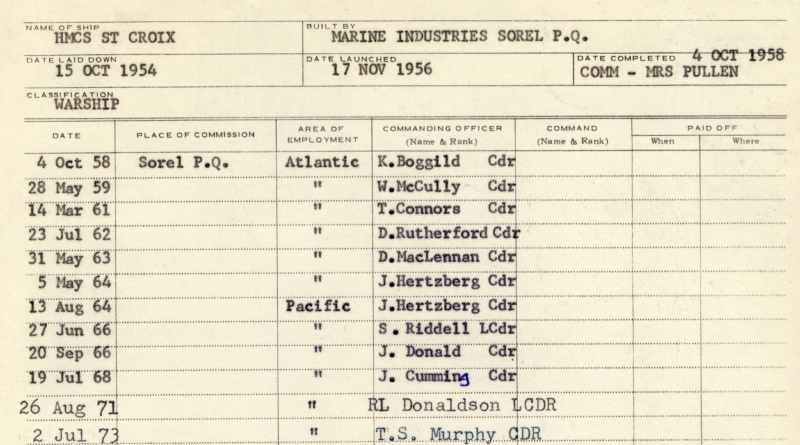 At this time “HMCS” is removed from the ship’s name. Responsibility for the ship may be moved by an ‘operational status transfer’ from the RCN to the Material Group of the DND. Disposal/Breaking Up. The taking of a ship out of government service, usually to a breaker to be broken up into scrap, though occasionally to become a museum ship or artificial reef. The ship’s name is retained until the ship is so broken up that she can no longer serve as a vessel. Each commanding officer of a warship of the RCN holds a Captain’s Ship’s Book in which is collected important information and certificates for the operation and engineering of the ship. The first page is titled Ship Particulars and Significant Events, and includes dates that the ship is laid down, launched and completed. There are also multiple lines for commissionings, in which captains record their change of command. Notes: 1. The Canadian Coast Guard uses the expression ‘dedication to service’ rather than christening. 2. The US Navy commissions ships.